Suzanne's Sweater honoring the words of Dr. Martin Luther King, Jr. This has become a tradition on "L.A. Is My Beat." 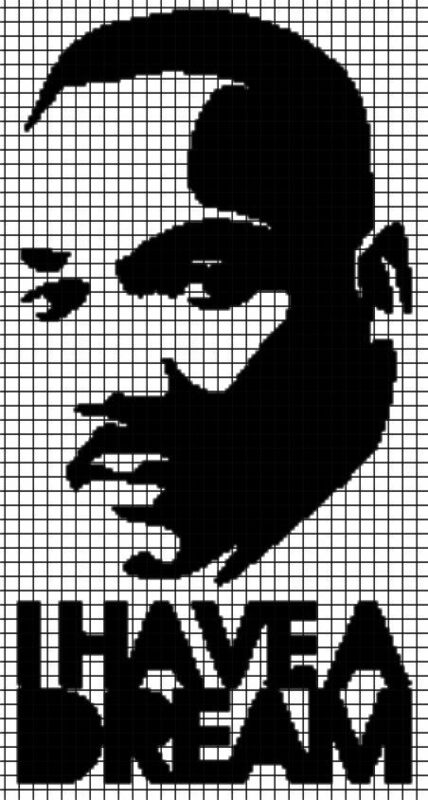 For the past eight years I have been featuring Suzanne's MLK sweater on my blog in honor of the birthday of Dr. Martin Luther King, Jr. I will repeat again this year because I'm so in love with this idea and in awe of Suzanne's mad skills. The sweater pattern is from "Mason-Dixon Knitting Outside the Lines." 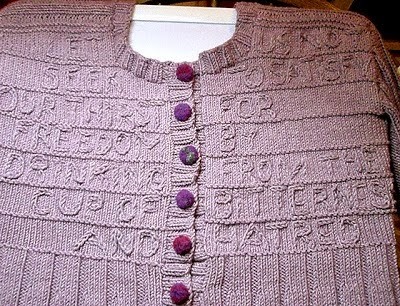 The name of this sweater is "Margaret," designed for the book by Mary Neal Meador. 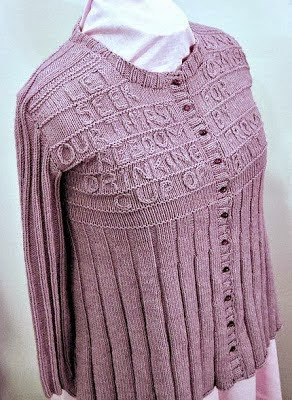 The instructions state that the sweater may be embellished after knitting with chain stitched quotations of the knitter’s choice. The sweater in the book has poetry added to the front and back. I knit this sweater for a local art exhibition that was organized to honor the ideas of Martin Luther King, Jr. I used quotes from his “I have a dream…” speech to embroider on the front and back of the sweater: Front: Let us not seek to satisfy our thirst for freedom by drinking from the cup of bitterness and hatred. Back: The whirlwinds of revolt will continue to shake the foundations of our nation until the day of justice emerges. I am still blown away by Suzanne's sweater and her choice of quotations. One day I will make such a sweater for myself. Bravo! Excellent work, Suzanne, honoring an eloquent man and his ideas!